I remember seeing the old Jimmy's building back in the day when I was looking at apartments - I swung by Park Lane in the Seaport District which was right across the street from it. According to the Globe, that space is going to house the newest and biggest Legal Seafoods yet. Jimmy's Harborside, one of Boston's most well-known restaurants, will not be rebuilt and will be replaced at its waterfront location by Legal Sea Foods. The new restaurant will be the largest in the Legal's chain. Owner Roger Berkowitz told The Boston Globe it would be three stories tall with 20,000 square feet of space. Isn't there a Legal's Test Kitchen over in that general area as well? Is it overkill to have both of them so close by? 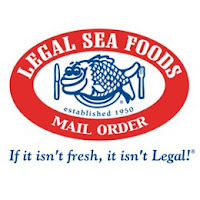 Then again, there's a Legals in both the Prudential and Copley and they seem to be ok.
1 Response to "Biggest Legal Seafood Ever Coming Soon"
Yup, there is LTK (Legal Test Kitchen) right near by. It's such a tourist restaurant that I'm sure it will do fine. Especially with all the contruction on Fan Pier and up and coming restaurants, retailers, hotels, etc.